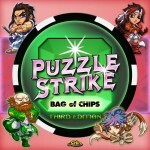 Puzzle Strike (Sirlin Games) by David Sirlin is a 2-4 player deck (chip bag?) building games where the players each take one of 10 fighters and attempt to defeat the other players by making sure that they have more than 10 gems in their gem pile at the end of their turn. The game draws its inspiration from the popular Puzzle Fighter series, where the players are attempting to fill their opponent’s grid area with colorful block but with a few tricks of its own. The game is playable by more than two players, but the real focus seems to be head to head battles. It has also spawn a sister game, Puzzle Strike Shadows also by David Sirlin, which adds more fighters and more Puzzle pieces and can also be played by itself. It is part of the Fantasy Strike universe, which also includes Yomi, Flash Duel and the upcoming Pandante, all by David Sirlin and all share the same cast of characters and powers. The game comes in a large, square box which contains a ton of materials: a nice, color rulebook, 4 bags for drawing chips, 4 privacy screens so that you don’t have to hold your chips in your hands, 4 player boards so that you know where to put your chips and then the chips. Lots of chips: 24 sets of 5 Puzzle chips, from which you will use 10 for any given game; 10 set of 3 Character chips; stacks of 1, 2, 3 and 4 Gems chips; stacks of Combine, Crush and Double Crush chips; and a whole bunch of Wounds chips. The materials are of high quality, with the start of the show being the chips: nice, 1 inch chips that are of a nice thickness and that have a nice weight to them. Some people have questioned the use of chips instead of having cards, but I have to admit that, as long as you are in good light, the chips do a nice job and also give a different feel to the game. You end up feeling like you’re gambling, and maybe you end up pushing your luck more often than you think rather than playing safe. And those who really want cards? 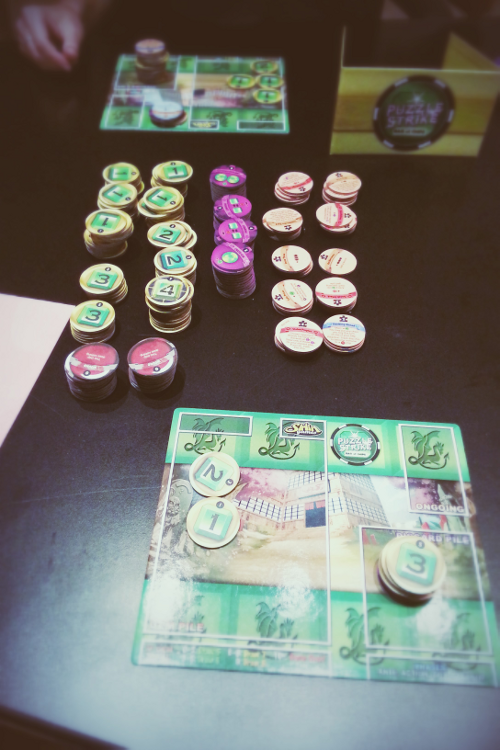 There is a Print-n-Play version available, which turns the chips into cards. The rulebook does a good job of explaining the game and going over some of the trickier chips but I for one would have like maybe a little more info on the Fantasy Strike universe. I know that this is a detail and that most people are here for the game, but it would have been nice to give some background, maybe even a touch more than most fighting games. The game starts with the players selecting 10 Puzzle chips stacks to use for the upcoming match. Each player then takes a set of 3 chips representing a character, adds 6 1 Gem chips and 1 Crush chip. This is the starting draw, which they put in their respective draw bags. Draw 5 chips from the bag, select a starting player and you’re ready to go! Ante: Depending on how many stacks of Puzzle chips have been depleted, the current player places a 1 Gem chip into his gem pile. If there are 1 more Puzzle chip stack depleted than the amount of player (ie, 3 stacks in a 2 player game), then the ante goes up by 1 for each extra stack (ante a 2 if 3 stacks are depleted, 3 if 4 and so on). Action: Do one action, based on the chips in the player’s hand. Some of the chips will allow the player to do extra actions, some of which will be color-specific, others will be any actions. Buy: the player must always buy at least one chip at the end of his turn, be it a Puzzle chip, a Combine chip or a Crush chip. Unlike Dominion, you can purchase as many chips as you can afford. If the player is unable to buy any chip, he must buy a Wound chip. Once purchased, the chip is placed in the discard pile. Cleanup: if the player doesn’t have 10 Gems in his Gem pile, he places all the chips that were used this turn as well as any chips that were drawn but not used in the discard pile. The player then draws a number of chips based on how many Gems he has in his Gem pile. The more Gems, the more chips are drawn. if he has more than 10 Gems, then he is out of the game. Character chips: each player has a set of 3 of these which will confer specific unique powers to the player. Puzzle chips: These chips will be purchased during the game and are worth anything between 1 and 12 gems to purchase. They are what the players will use to manipulate the game into allowing them to pummel their opponents. We will look at them more in details a little lower down. Crush, Double Crush and Combine: these three types of chips are always present in the game and are the most basic way that the players will use to get rid of their gems. Wounds: these are dead chips. They do absolutely nothing and take space but can sometimes power some of the more complex Puzzle or Character chips. One of the most basic action of the game is that of Crushing gems. Simply put, when the player uses this chip, he selects one of the gems in his gem pile, Crushes it into a equivalent amount of 1 Gems and sends them to the other player’s pile. Should the other player have a Crush of his own (or even better, a Double Crush), he plays that chip and also selects one of his gems from his gem pile to Crush back. If the same amount of gems are Crushed by both players, they are simply placed back into the stock. if not blocked or only partially blocked, the remaining 1 Gems are placed in the opponent’s pile. Note that if the response was larger than the attack, then the attacker is the one who is left with more Gems in his pile. In other words, make sure you send the largest possible Gem to your enemy lest you get caught.. There is one caveat to the Crushing: if the gem that was Crushed was a 4 Gem, then this is unblockable meaning that they will all land in the other player’s gem pile. Using Crush and Double Crush also gives the player 1 or 2 gems with which to purchase chips at the end of his turn. Another basic action is Combine, which allows the player to take two Gem chips in his Gem pile and make a larger chip out of it. The only limitation is that they cannot combine to be more than 4. Note that unlike Crush/Double Crush, the use of this chip also comes with a penalty of 1 Gem to purchase, but it does allow the player to take another action when played. Puzzle chips have a few components: a cost, which is in a puzzle piece icon; a colored banner which contains the name of the chip and maybe an additional icon (a red fist that denotes an attack; a blue shield that denotes a reaction chip to a red fist; a purple sphere that denotes a Crash attack and finally a purple shield which denotes a Crash react); a short text and/or series of icon that state what the chip can do. Mostly, the icons either coins that indicate that additional chips can be drawn; arrows to show that additional actions can be taken (either generic or color specific, which are tied in to the color of the banners); piggy banks which allows you to keep a chip for next turn; or money, which can be used to purchase a new chip at the end of the turn. The colored arrows need a little more clarification: most of the time, the arrows on a chip will be black, meaning that any other chip can be used for an additional action. In some cases, however, the arrow will be in one of four color (brown, purple, red or blue), which are the same color as the banners on the chips. When the arrow on a chip is colored, this simply means that the next chips played must have a banner of the same color. This can get tricky as you need to set up your turn perfectly. There is an official implementation of the game online, with tournaments, leaderboards and other events. It is quite well done, with the full range of Characters and Puzzle chips, both in the basic version and the Shadows version. The site also supports both Yomi and Flash Duel. I really like this game. In a lot of ways, it solves some of the issues I’ve had with Dominion and some of the other deck-building games I have tried so far. By having the victory condition tied so closely to an event that is happening at the start of each turn (ante up, which brings you closer to having 10 gems in your gem pile), it forces the game to have a certain momentum since you need to do something about it else you will lose simply for doing nothing. You simply cannot wait and tinker with your deck, you need to get rid of those gems. Same thing with having the amount of chips you pull being tied closely with the amount of gems in your pile: the closer to losing, the more you draw, which makes you more powerful and thus able to bring down real retribution. Everything is tied in to the pile and the fact that if you get 10 at the end of your turn, game over, you lose. Again, same with the Combine chip, which allows you to combine two chips to make a bigger chip. Brings you closer to losing, but at the same time, you can get a very powerful 4 gems chips, which is unblockable when you crash it. See, constantly playing with fire, which brings about tension and with it, fun. Lots of fun. So instead of having two or three phases in the game, you suddenly have very fluid phases, where, depending on your style of play, you might want to push your luck and get 7 or 8 gems in your pile so that you can combine them, draw lots of chips and launch a very devastating attack next turn, going right back to 2 or 3 gems instead. Of course, there are some Puzzle chips and characters that deal exclusively in that dangerous territory. 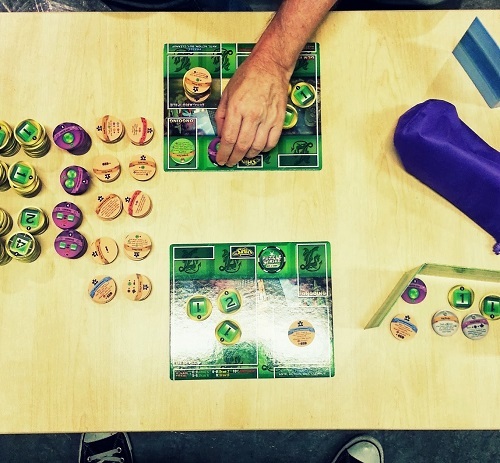 The game is very easy to teach, and once the players get their head around the core concept of the gem pile, crushing and combining, games will take less than 30 minutes. It does take a certain amount of time to figure out how the different Puzzle chips work together and how to best use your Character chips, but that’s the fun part. The Character chips is also another unique aspect of the game. By giving each players a unique set of 3 chips that only they will have in the game, it forces the players to adopt a certain style. Sure, they might want to ignore these chips and simply play with the Puzzle chips, but I’m pretty sure that it would be a huge mistake to do so. The Character chips might force you to play a certain way, but at the same time they allow you to gain a sizable advantage when you play them the right way. I haven’t tried the Shadows set yet but it looks like it’s bringing its own bag of curve balls to the game. The Characters chip sets are even crazier, with many of them centered around your gems pile and how many chips are in it. At first blush, I would say that if you’ve never played Puzzle Strike before, you might want to go with the base set as the characters are a little simpler and so are the puzzle pieces. Once you’ve master the base set, then Shadows might be good. This being said, both sets are standalone, a fact that I’m not sure I like since by buying both sets, I ended up with a lot of stuff that I didn’t need. I understand the pure economics of wanting to not lose a sale if the customer doesn’t have/want the other set, but by doing this, you’ve got two sets that are the same price (roughly $50US), but with a whole bunch of pieces that are not necessary. If Shadows was a pure expansion, it could have been sold at around $30US instead. Not a huge deal, but a little annoyance nonetheless. I really recommend this game to anyone who likes competitive games and deck building games. It is a fun, fast, easy to learn yet hard to master game that simulates beautifully the flow of fighting games.